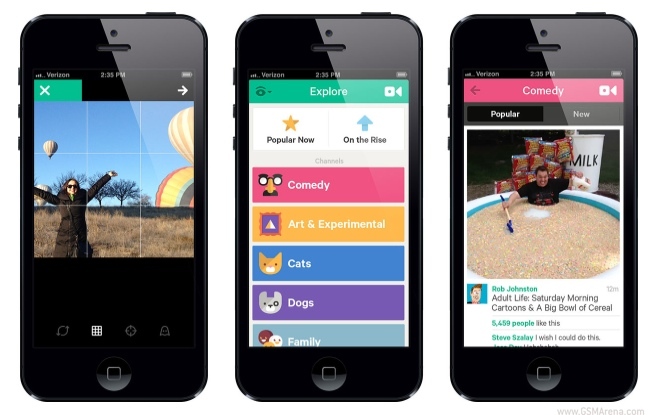 Vine has updated the iOS version of its app with several new features. First of all, there are some new camera tools such as grid mode, focus and ghost. Focus allows you to tap on the screen to focus at a particular point (usually tapping on the screen starts the recording). Ghost places a translucent overlay of your last shot on the viewfinder to make composition easier. The other new feature is channels. There are now 15 channels that you can upload your videos to, such as comedy, music, art, cats, dogs, etc. and you can also choose to view Vines from a particular channel. Next is something called ‘revining’, which is similar to retweeting on Twitter. Basically, it lets you share other people’s posts on your timeline. There is also a new On The Rise section for showcasing popular new posts on Vine. Lastly, Vine now allows you to protect your account and only approve people you want to view your posts. The Android version of the app only gets the protected accounts feature for now and other features are expected to arrive next week. You can download the iOS version from here.